The Government will decide what level of profit is acceptable! Why a water tax? Because tax is in the Labour Party's DNA. They think they know how to spend kiwi's money better than they do. "Businesses run on getting their costs down and their incomes up" vs "Businesses will benefit from our education policy" – you choose. #LeadersDebate 'you can't say 'I'm worried about your poor wage, and I'm gonna make you pay more tax.' – English pivots to tax. “We’ve made estimates from our policies…” — @jacindaardern. Not an overly confident sounding line from someone who could be PM. #LeadersDebate 'We've been really clear….' always followed by unclear stuff from Ardern. Bill English – people can’t go shopping with your values they need to know the impact your policies will have. Bill English: with strong economy can achieve social and environmental objectives. BIll English: transparency would require Labour to tell freezing workers their taking $1000 off them to give students a bit more. Bill English – We’re out to earn every vote in the next three weeks. Policies are well costed and clear unlike high level vague ones from Labour. Would you like more tax with your tax? Stampcrab – someone clumsy and heavy footed. Marlborough farmer Doug Avery had already faced more than his fair share of difficult times when successive droughts through the 1980s and 90s struck. It got so bad that he hated to go outside and despair turned to depression. He treated that with alcohol and anger, neither of which helped. The turning point was a meeting addressed by Lincoln University professor Derrick Moot. Doug became a convert to lucerne and started working with the environment rather than against it. He not only turned himself and his farm around, he used what he learned to help others become more resilient on their farms, in their businesses and their lives. 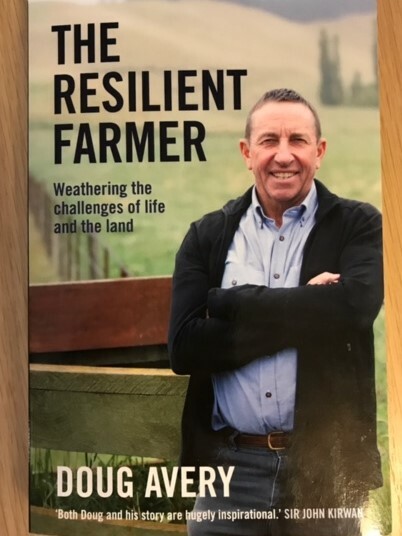 He’s told his story to many different audiences and now he’s written it in The Resilient Farmer, weathering the challenges of life and the land. It’s an honest and simply written account of his life and troubles which could have sunk him and nearly did. It’s sad in places but far from being depressing, it’s an inspirational read. It’s one of the best stories of or by a farmer I’ve read but that doesn’t mean it will only appeal to people interested in farming and farmers. The book would make a great gift for Fathers’ Day but that doesn’t mean it would only appeal to men. It would be of interest to a wide audience, men and women, country and town. The Resilient Farmer is co-authored by Margie Thomson with a foreword by Sir John Kirwan. It’s published by Penguin Random House with a retail price of $40. Doug has a website Resilient Farmer. Doug and Wendy are interviewed by Kathryn Ryan on Nine to Noon. A change to coastal South Canterbury’s farming rules will come into force next month and despite an initial challenge, farmers say they are now looking forward to helping protect a nationally significant wetland area. The South Coastal Canterbury Plan Change addresses both water quality and water quantity in the catchment, which includes Wainono Lagoon. Environment Canterbury councillor Peter Skelton said the schedule set out good farming practices relating to nutrient management, irrigation management, grazing intensively-farmed stock, farm cultivation, and animal effluent. . . They originally grew some apricots, but they now focus solely on growing several apple varieties, using organic principles. The orchard is certified under BioGro as part of the Springvale Apple Growers Partnership. . . The company supplies precision guidance systems to the primary food production industries with the cloud-based system allowing accurate task management and placement reporting for products, people and vehicles in-field. . . Researchers interviewed both technologists and members of the agrifood industry – and found there was a gap between how the two groups perceive the future. . .
(BusinessDesk) – Red Stag Timber, which developed New Zealand’s first ‘super mill’ a year ago, plans to step up production next year to meet demand in its local and overseas markets. The Rotorua-based Waipa Mill increased its production of sawn timber to an annual 550,000 cubic metres from 450,000 cubic metres after investing over $100 million in more efficient machinery, transforming the mill, and plans to lift production further to 600,000 cubic metres from next year, general manager Tim Rigter told BusinessDesk in an interview at the Waipa State Mill Road site. . .
A no-frills approach has seen Hawke’s Bay-based rural wireless broadband company AoNet Broadband successfully compete with the giants of the industry to win a slice of the Government’s latest rural broadband funding package. Telecommunications Minister Simon Bridges today announced AoNet Broadband as the Wireless Internet Service Provider for the King Country, making it responsible for connecting homes over an area that includes remote and mountainous terrain. The appointment is part of a $150 million funding package for telco companies to partner with the Government through Crown Fibre Holdings Limited (CFH) to bring better broadband and mobile services to an increased number of under-served rural areas, state highways, businesses, residents and tourists in New Zealand. . . According to a press release from SFF the company’s first sea container leaves this week for arrival early next month, claimed by the company to be the first sea freight consignment of chilled product to the Chinese market which has only recently opened up to New Zealand meat exporters. However, I have since been informed that the first shipment from Greenlea arrived on 18th August and a chilled container of AFFCO product is already on the water, arriving on Friday 1st September, with a container of chilled mutton being shipped next week. According to SFF’s press release the company has already trialled small quantities of chilled beef cuts to food service distributors for high end restaurants and lamb cuts to a multinational supermarket chain. But the sea shipment is planned to test the port and supply chain protocols for large scale consignments of chilled product. . .
Swiss meat prices are pretty hard to stomach at first glance. At $49.68, Switzerland tops the ranking for a kilogram of beef leg round. Yet that seemingly eye-watering sum – around 150 percent higher than the world average – gets more reasonable when you factor in what locals get paid: An unskilled worker needs just 3.1 hours to afford it. The 2017 Meat Price Index is a foray into the study of relative price levels of goods and labor. According to publisher Caterwings, the cost of beef, fish, chicken, pork and lamb in each country’s biggest cities were compared to the minimum wage and then calculations were run for affordability. In those where there is no federal statutory minimum, it used the average pay for unskilled labor. . .
(BusinessDesk) – Rural services firm Allied Farmers reported a 60 percent lift in net profit on an improved result from its livestock division, particularly in the second half, and further cost reduction. The Hawera-based company said net profit was $2.2 million in the year ended June 30 versus $1.4 million in the prior year. Pretax earnings were up 52 percent to $2.4 million, which was ahead of the guidance it gave in June when it forecast a 40 percent gain. . . The questions are up to anyone who chooses to pose them. Anyone who stumps everyone will win a virtual rhododendron. You are currently browsing the Homepaddock blog archives for August, 2017.